Robert Herrick: Upon Julia's Voice. Amber, used here merely for any rich material: cp. "Treading on amber with their silver feet"
Gentileschi, Orazio. 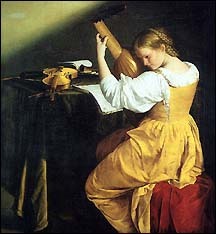 The Lute Player, approx. 1610. Created by Anniina Jokinen on September 7, 1997. Last updated on February 8, 2001.